The power of Conley's story resides not only in the vividly depicted grotesqueries of the therapy system, but in his lyrical writing about sexuality and love."" -- Los Angeles Times ""This brave and bracing memoir is an urgent reminder that America remains a place where queer people have to fight for their lives... 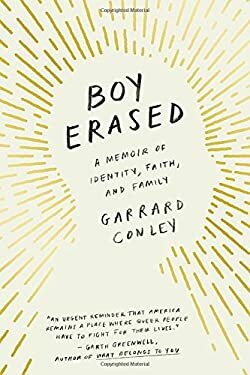 Boy Erased is a necessary, beautiful book."" --Garth Greenwell, author of What Belongs to You A beautiful, raw and compassionate memoir about identity, love and understanding. The son of a Baptist pastor and deeply embedded in church life in small town Arkansas, as a young man Garrard Conley was terrified and conflicted about his sexuality. When Garrard was a nineteen-year-old college student, he was outed to his parents, and was forced to make a life-changing decision: either agree to attend a church-supported conversion therapy program that promised to ""cure"" him of homosexuality; or risk losing family, friends, and the God he had prayed to every day of his life. Through an institutionalized Twelve-Step Program heavy on Bible study, he was supposed to emerge heterosexual, ex-gay, cleansed of impure urges and stronger in his faith in God for his brush with sin. Instead, even when faced with a harrowing and brutal journey, Garrard found the strength and understanding to break out in search of his true self and forgiveness. By confronting his buried past and the burden of a life lived in shadow, Garrard traces the complex relationships among family, faith, and community. At times heart-breaking, at times triumphant, this memoir is a testament to love that survives despite all odds. New (699 available) BRAND NEW. Over 1.5 million happy customers. 100% money-back guarantee. Make your purchase count: support Better World Books' worldwide literacy partners.